Our last post, Be Intentional About Personal Marketing and Business Development, provided reasons for and tips on how to become more intentional about business development. One aspect of business development that can become very time-consuming and expensive is attendance and speaking at conferences or seminars. 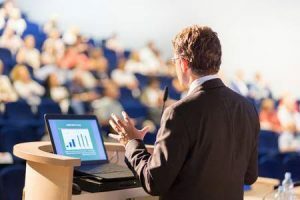 Before accepting invitations to speak or requesting approval to attend a conference, it is important to ensure that specific conferences and speaking engagements will in fact advance your business development or professional objectives. Perhaps the most important is that top clients plan to attend and ask if you are attending. Doing so would allow you to spend some good social/non-work time with them there and they can introduce you to others you don’t know. The most effective and easiest way to get hired by your next client is to be introduced by an existing client — this provides a natural opportunity for an introduction and immediate credentialing. Another good reason to attend a specific conference is for networking more broadly with other clients, referral sources and prospects, preferably after you have confirmed that they plan to attend. Speakers and other experts who serve on panels and give presentations can also serve as fertile resources for information on trends, provided you have a targeted strategy to meet and network with them. Attending a conference is often a good way of getting to know the association’s executive team and program planners for future speaking opportunities. It also helps to evaluate the ROI of a future sponsorship. There may be one or two conferences you or someone from the firm must attend to “be seen” to be considered a player in an industry. This also could be a regional conference where there is a political or professional reason to be there and absence could send a negative signal. If you are gearing up to become an expert in a new, emerging niche or need to keep up with your area of expertise, certain conferences can be an effective way to learn/stay updated on area of law or industry to develop or maintain own expert knowledge. Which 2-3 conferences will I attend this year and why? Which clients have I contacted about whether they will attend? Whether they consider this a “must attend” event and why? For what primary purpose do clients attend this conference? Social networking? CLE? Leadership role? What percentage of attendees and speakers are lawyers in competing firms? Are the client/prospect attendees in decision-making positions? Where a few clients are based so you can make visits to them while in the area? In a convenient location so that the travel logistics are easy? In a location where you can tie in some personal time with friends, family or a vacation? What special networking events are scheduled? Is there room to schedule my own smaller group networking events, e.g., a breakfast, cocktail reception? Do the requisite follow-up: send e-mails within 48 hours, invite to connect on LinkedIn, add to firm list and InterAction or Outlook, etc. If I cannot be sure I will give it the time and attention it deserves, can I identify another partner or Of Counsel/Senior Associate who might benefit from this opportunity? When clients are asked to rank the effectiveness of lawyers’ marketing activities, speeches and seminars continue to be among the top on their list. The reason is that prospective clients can be educated but also gauge a lawyer’s expertise and personal style. Speaking publicly can be one of the most effective ways to communicate your expertise if you are doing so to the right audience about the right topic. You are able to promote your expertise in a new or existing niche for which you seek greater visibility and name recognition. If you select a topic that is timely, has not yet been presented many times before and is one about which you have deep knowledge and distinct experience, you can become known as a thought-leader to a targeted group of decision-makers. Some lawyers speak because it forces them to get or stay up to speed on a topic or area of practice. Having to research recent case law or regulations in a niche helps them provide better service to clients at the same time as getting some visibility. If you have found a speaking opportunity at a venue that you know clients will actually be in attendance, it allows you to confirm your credentials and your “style” to prospects and clients and confirms for clients that they made the right choice in hiring you. Agreeing to speak or being moderator of a panel allows you to invite 2-3 clients or key referral sources to join you on the dias. Clients often appreciate opportunities to build their own credentials and visibility too. On what topics will I speak this year that will advance my reputation in a niche? Have I selected a topic that is a unique or new angle that defines the issue in the audience’s terms? How does my topic solve a client problem or present an opportunity? On what topics are clients most interested? Which clients have I run my topic idea by to gauge their interest about it? Is this invitation to speak on one of those topics? Is there a client I can invite to co-present with me? What is the purpose of this seminar? Do many attend in order to obtain mandatory CE/CLE credit (could mean a lower level of attendee)? Who will attend the presentation? Are the attendees in decision-making positions? What percentage of people in the audience are likely to be lawyers in competing firms vs. people who can hire you? How will I prepare for my presentation – make it interesting, short and practical? If I am filling in for another lawyer who had to cancel but had already prepared the PPT, will I rehearse and adjust it to my style? During my presentation, what additional back-up information will I offer to send afterward if attendees provide me with their business card? Do the requisite follow-up with follow-panelists, the program organizer and others I meet: send e-mails within 48 hours, invite to connect on LinkedIn, add to firm list and InterAction or Outlook, etc. If I cannot be sure I will give it the time and attention it deserves and I am not sure whether the audience will be decision-makers, can I identify another partner or Of Counsel/Senior Associate who might benefit from this opportunity?